The pattern is now clear to me. Every month after the Wonderboxxes arrive, Peanut attacks hers with great concentration. Within a period of just a couple of days, she'll be done creating her new gizmos. 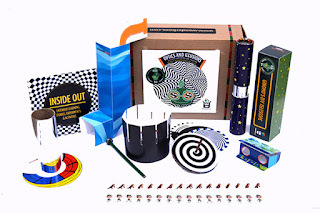 Her October box was ''Optics & Illusions'' - you can check it out here. a. A little book on optical illusions: Some of the time tested ones like whether you're seeing the face of an old woman or a beautiful princess, and some new ones I'd never seen. She was thoroughly tickled by these and even spent time copying them out in her own notebook. b. A spinner toy: this was thoroughly entertaining for Peanut. She spent a lot of time showcasing how the spinning patterns caused the effect of something entirely different while in motion. 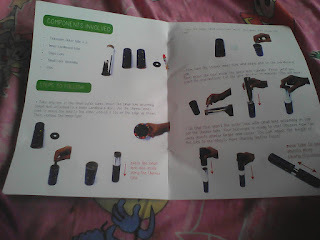 c. A periscope, a telescope and binocular making set -she was done with these very quickly, although with the last one, she insisted on my 'helping' her - this was also when she saw me helping Pickle and Papad with their box, and I suspect she was feeling left out. 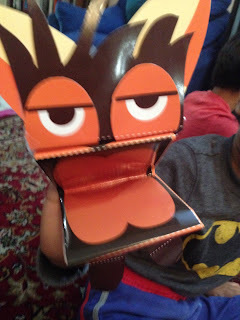 Otherwise, as far as the Ginomo boxes, meant for the older kids go, they can be handled pretty independently. My verdict: Overall, pleased with the way Peanut is taking to the Wonderboxx. Happy about the time that it keeps her busy and away from trying to get in screen time. Of course, she's a big reader, but it's nice to see her building stuff. She also intends to take some of these creations to her Show & Tell at school, which is a great thing from a confidence building point of view. So good job to the team at Wonderboxx! 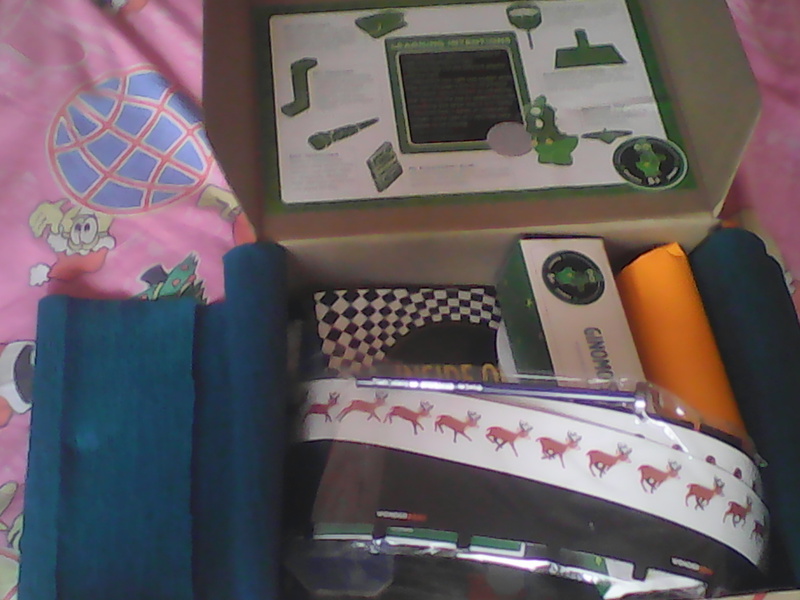 This month another wonderboxx came. I think this one was the coolest for me so far. 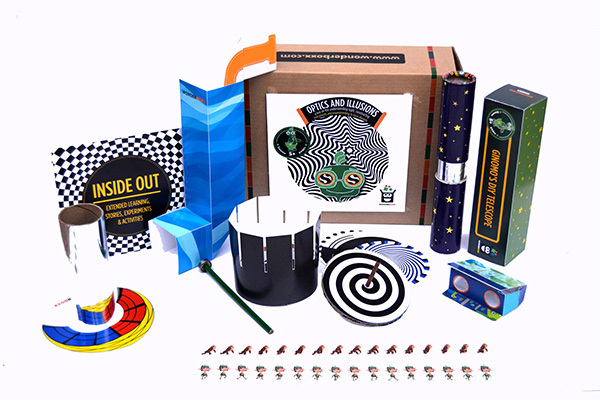 My wonderboxx subject was "Optic Illusions." 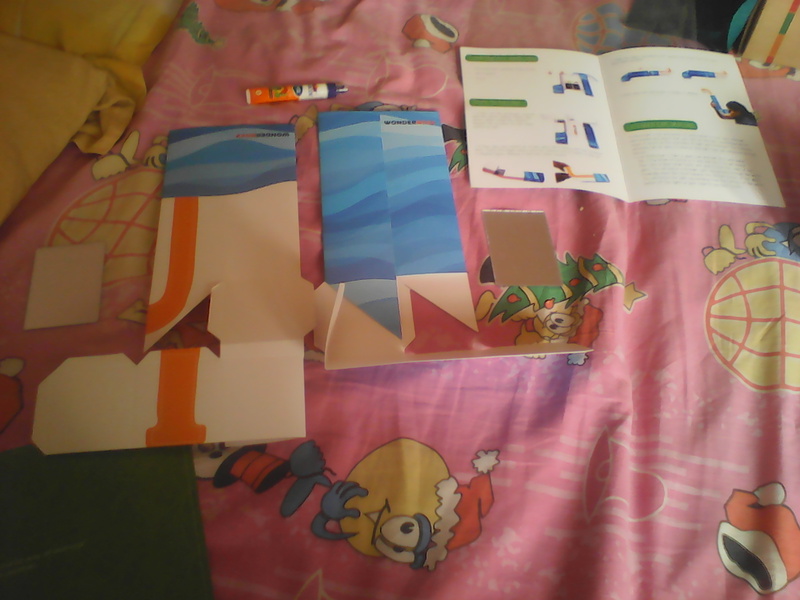 In this wonderboxx I made a pair of binoculars. They were blue in color and had pictures of sea creatures on them. The parts were really easy to get as they came in the wonderboxx itself. I also made a telescope,periscope and a spinner toy. The spinner toy was the coolest. The paterns were different and beautiful. One patern was created in the way some persons eyes were getting hypnotized. When it was spun the circles moved round and round. Another had dots which were like circles when spun. 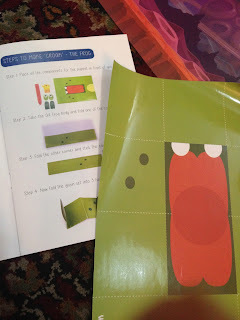 I also got a book which was called "Inside Out". It had so many cool things. Like there was a dog which ears shaped like cats. It asked below it "Dogs or Cats?" Then there was a picture of an old lady in which when I turned the book upside down was a princess. There were many examples like this. So long till my next blog! 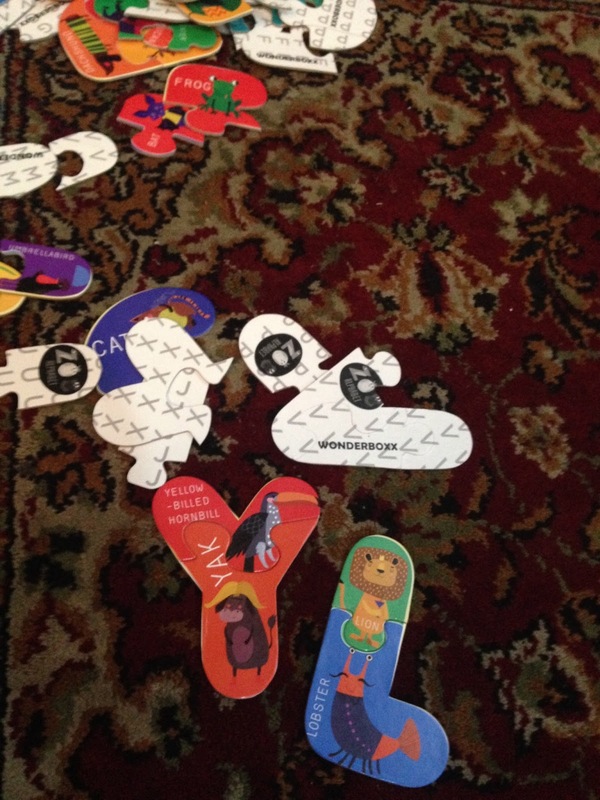 The twins, on the other hand, got a box for the Kiddo age group, called 'Words & Storytelling'. You can check that one out here. 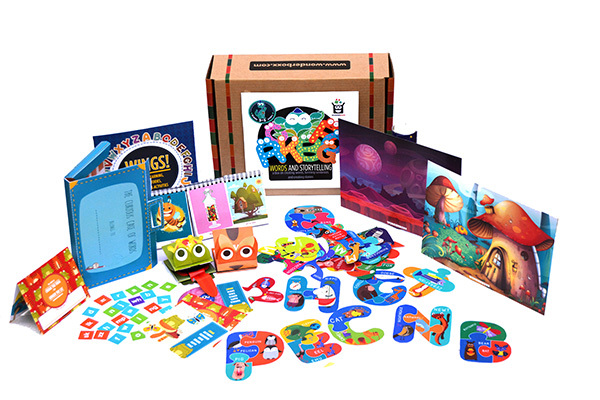 It consisted of stuff like a story-telling puppet-making kit, a calendar, a word-building folder, alphabet puzzles. Unlike with Peanut, the twins, since they're smaller and not quite as dextrous, this box as usual required a lot more parental involvement. Something that Wonderboxx is making me discover that I still need a lot of patience and work for. I was glad for the theme since I'm really trying to get them to read more as THE most key skill for them. The box had puppet-making, which we did together and which actually turned out nice because they made this frog and tiger-type-cat set and performed a little impromptu skit behind the sofa. 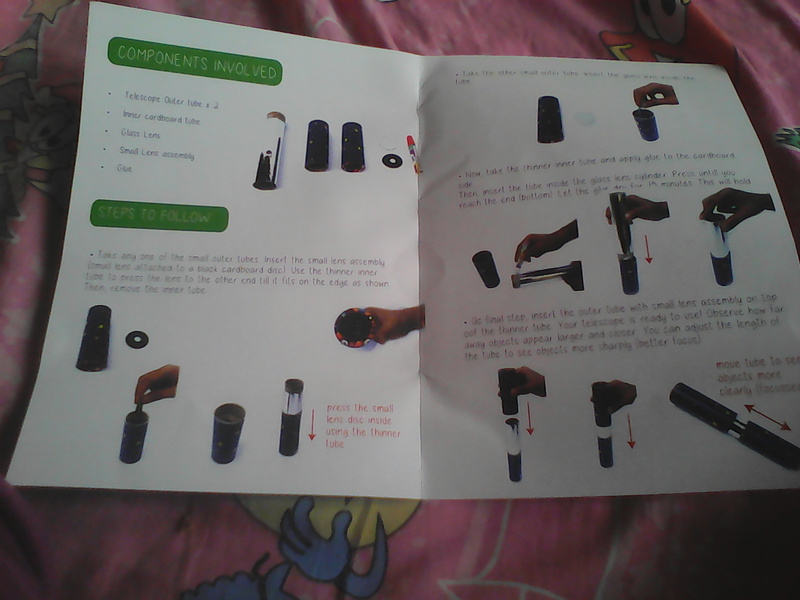 The one thing about the Wonderboxxes is that they don't always come with a LOT of instruction. I assume this is because they want kids to figure stuff out on their own. For someone with limited time and patience like me, this is really an exercise in patience, and we definitely have a lot of near-melt-down moments with the twins deciding that they want to do something their own way. As far as the twins boxes are concerned, I think they're as much about getting a parent more aware of their parenting styles and flaws as it is about firing up a kid's creativity and imagination. I approach each Kiddo box therefore, with some trepidation. Over time, though, I think the twins are also getting reconciled to the fact that they have to share a box, that things won't always turn out perfect as shown in the colourful manuals, and so on. So overall, there's growth involved. And especially since these two aren't readers like Peanut, I am glad that there's something to distract them on a monthly basis. We've yet to finish exploring their box thoroughly, even though it's been with us for a while. I want to take out the time to do it myself rather than leave it to them to tear through the box and lose the pieces. Maybe I should let go a little, eh? In the meantime, I'm already looking forward to opening their November box...since it's the one on handling emotions - ''Superheroes & Feelings'', which you can take a look at here. 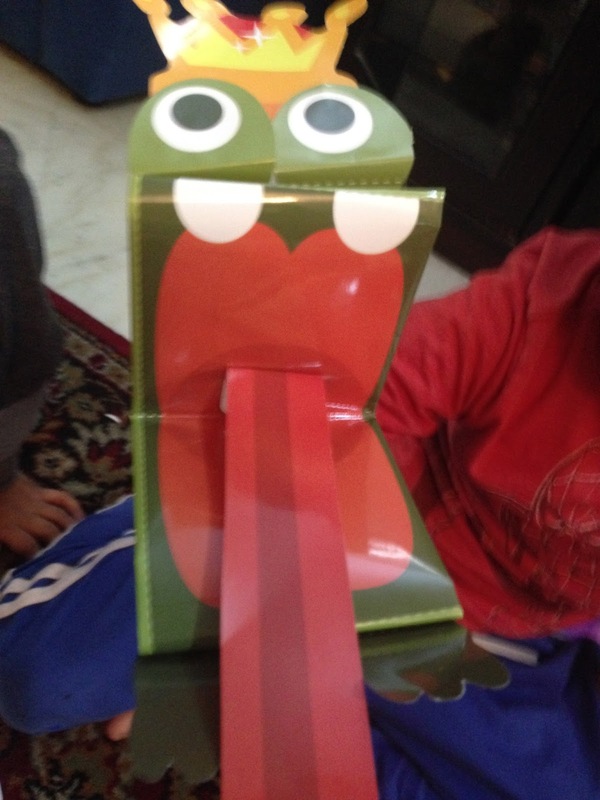 Your kids are really exploring their capabilities and interests. Hi, I'm Jassie. I have read one book of yours and have become a fan��.. I'm a stay-at-home mum as of now and am beginning a writing career of my own too. My daughter has just turned one recently and she's plain clingy nowadays too so whenever I get the time, I take the time to write..